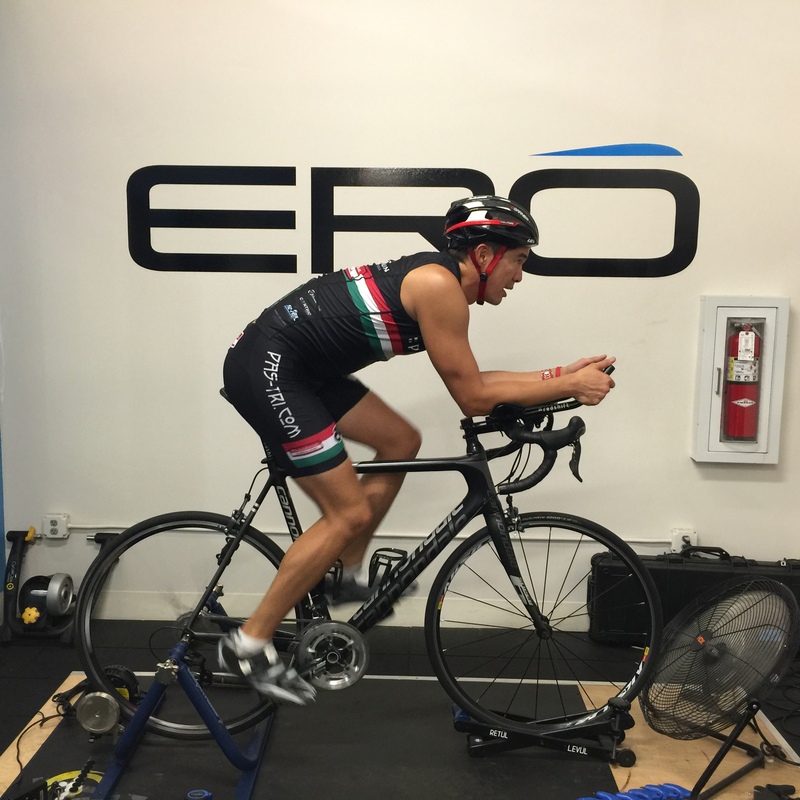 I got two of my bikes custom fit with Jim Manton at ERO Sports. Jim fit my old blue Felt bike a couple years ago. I used the old measurements to set up my current black Cannondale Supersix. So even though this was the first time he has fit me on this bike, it was very close to a good fit. A good fit is one that is comfortable and aerodynamic and power efficient. Jim is a PRO. He fits pro cyclist from all over. He’s too modest to name drop, but he could. He has also fit many of my friends at Pasadena Triathlon Club. I bought a Redshift Aerobars and Seatpost system. 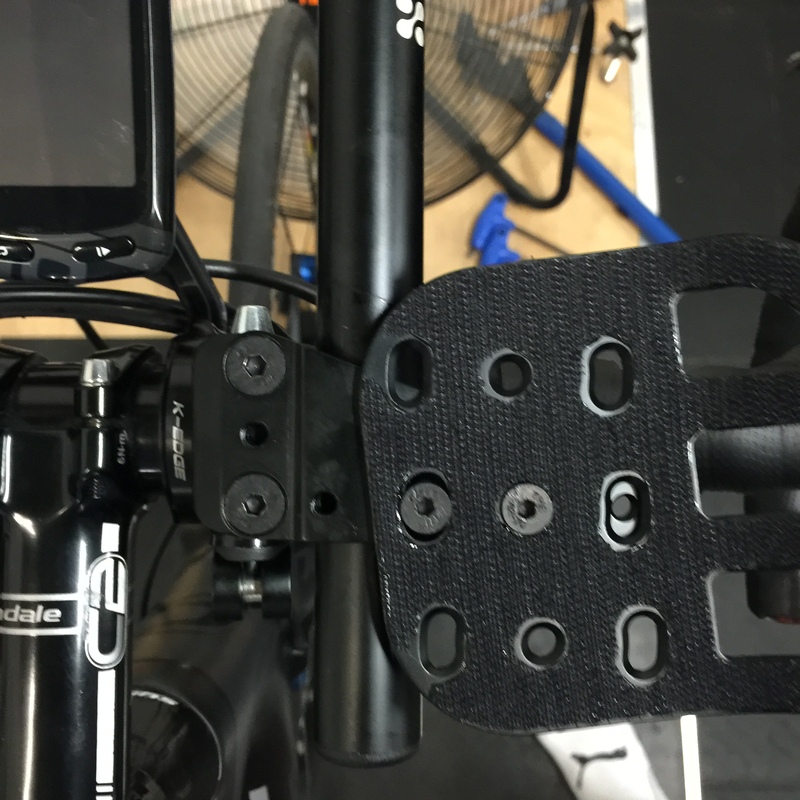 The aero bars use a quick release feature that is very stable AND easy to take on and off quickly. 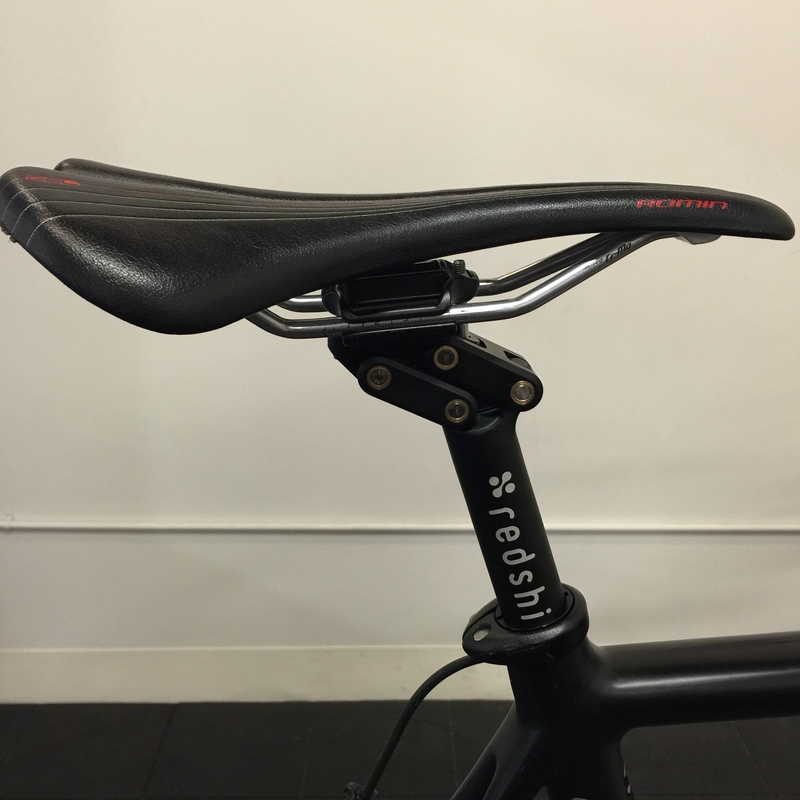 The seat post snaps forward and up to an aero position and back and down for a traditional road position. I mounted the aerobars last week, and found out that the seatpost shaft needed a shim. I quickly ordered it on Amazon so that I would have it ready for the bike fit today. The 26mm diameter seatpost needed a shim to fit my 31mm seatpost shaft. I just got the part from Amazon two days. Whew. He mounted my saddle and used my old numbers and tried it out. It was very good fit right off the bat. He used my measurements from my old bike fit as a guideline. 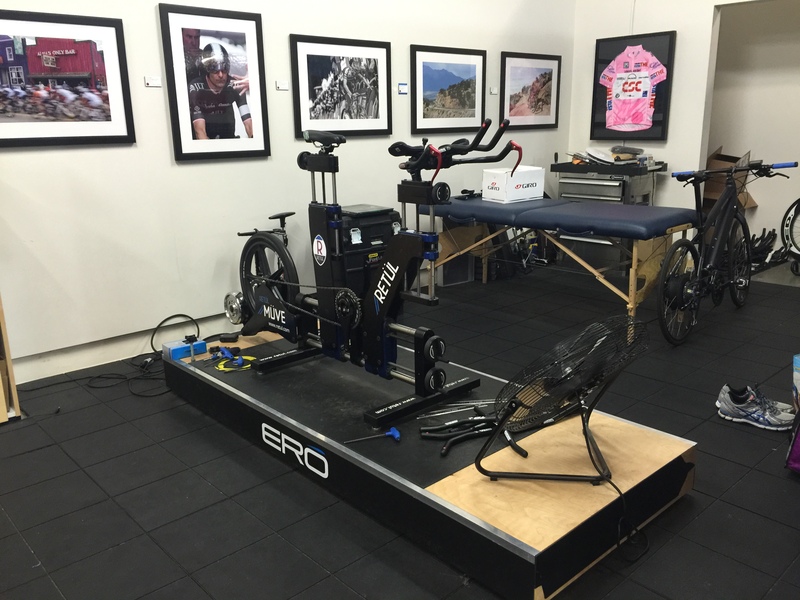 The bike was mounted in a CompuTrainer with a light load so I could pedal for real, while he looked at it. 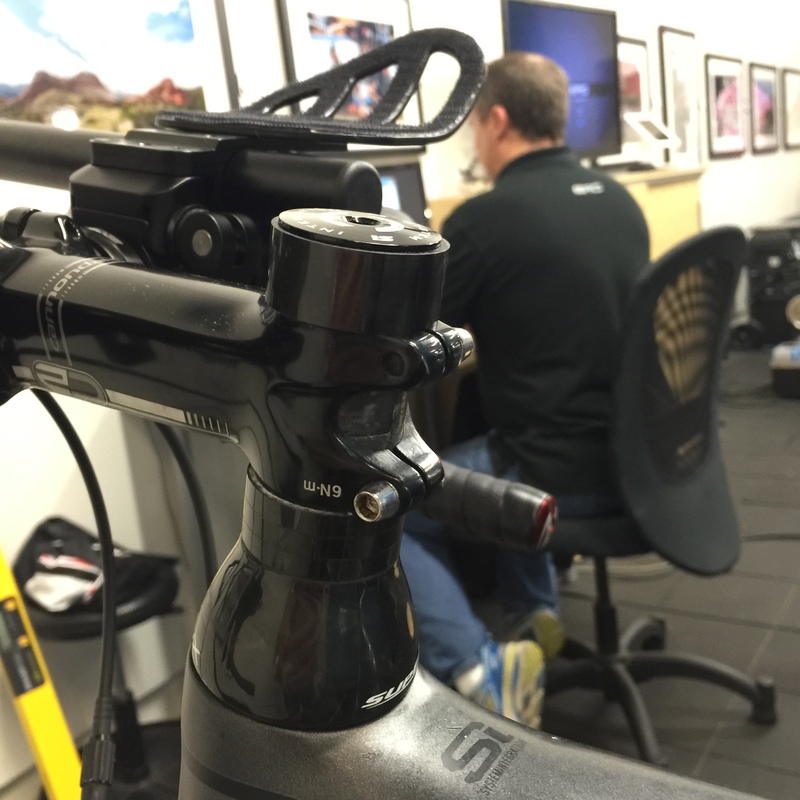 The Redshift seatpost can be switched on the fly, while riding. It’s two bike fits in one. (1) Bicycle Setup Report_Redshift Standard Position.and (2) Bicycle Setup Report_Redshift Forward Position. He made some minor adjustments and then had me take it out for a test ride outside. The test ride is about a mile straight, with a section with a mild climb 3-4%. It’s perfect for test riding a new fit. I did one loop in the standard road settings and another loop ascending and descending in aero position. 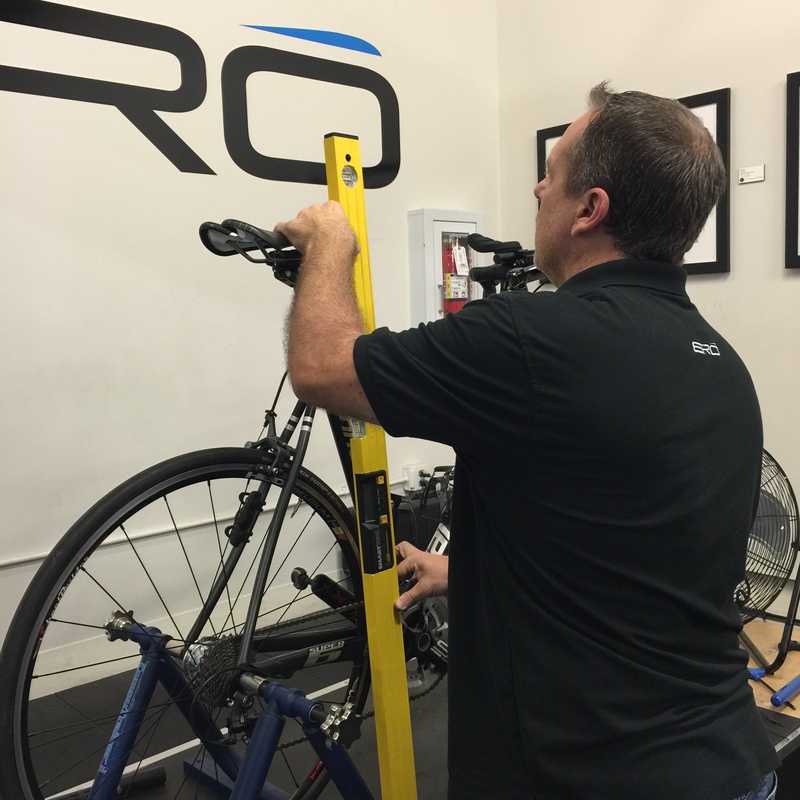 He has a Retul System for first time fittings. This is a motion detector system and you wear sensor tags on all major joints and bike anchor points. This is how he got my original numbers a couple years ago. This time he already had my numbers in the computer for road bike. He has a camera system and probe that imports the data into the Computer. Then, he set up my (3) Bicycle Setup Report_Cervelo Dual. I bought this bike used a couple years ago and never loved it. I figured if he set it up right, maybe I’d love it and not buy a new TT bike for IMMT. He had to make adjustments on the seatpost and the saddle. He had me pedal for a bit, then sent me outside for a test ride. It was great. 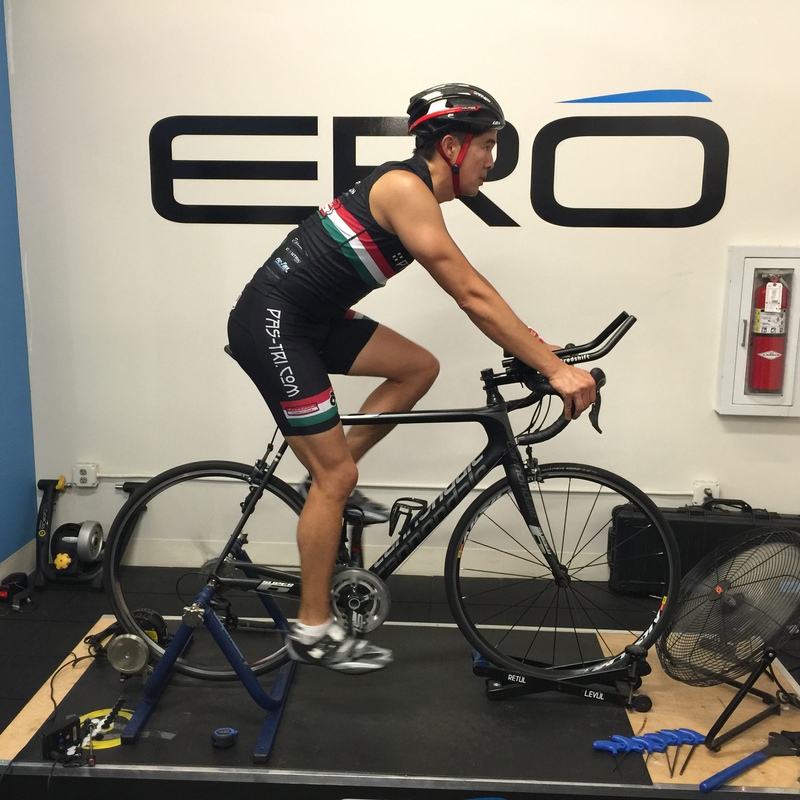 Jim surprised himself on how fast he dialed the TT bike fit in. He says that the Cervelo TT Dual will be great for flat course, such as the River Trails. It will be at least 1 mph faster, with same amount of effort, than the Cannondale Supersix. The Cannondale Supersix will be great for climbing and combo courses. If the race is a combo course, then the Cannondale may be a better choice. He’s interested in seeing my power numbers and comfort choices. He also commented that the Redshift System advantage isn’t just for climbing and ascending. It also improves descending. I will feel more comfortable and more stable descending on the Cannondale than the Cervelo. In comparison, the Cervelo TT position is aggressively forward, which puts more weight on front wheels and is less stable descending. So, the Cannondale will ascend and descend faster than the Cervelo. Now, I have to check the IMMT course and see which bike may be best. In the mean time, I’ll start taking the Cervelo to Computrainer and getting position and power data. Fun stuff! 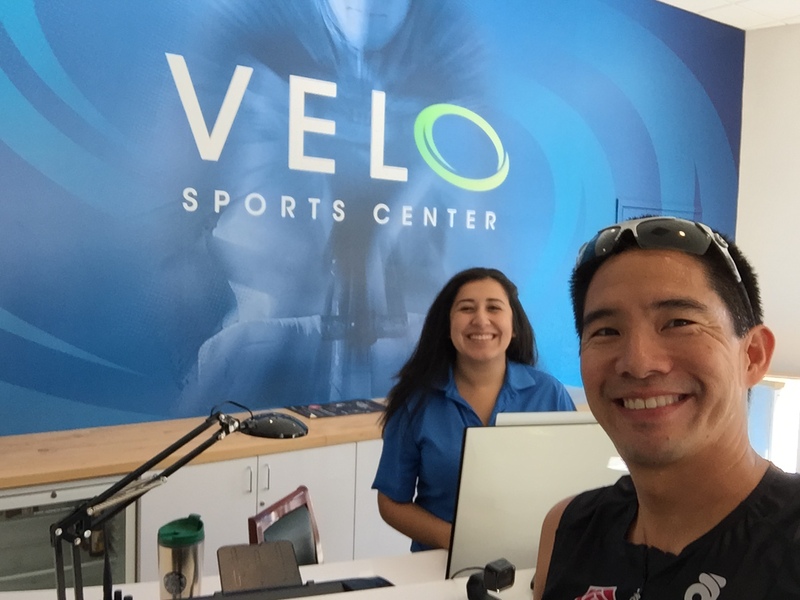 As an aside, Jim’s fit studio is inside the Velo Sport Center in Carson. 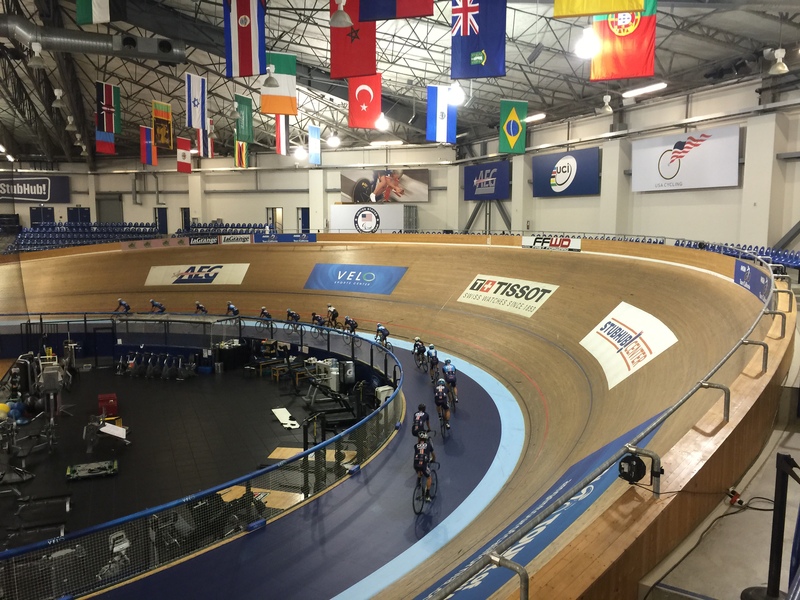 Velodrome is so cool. 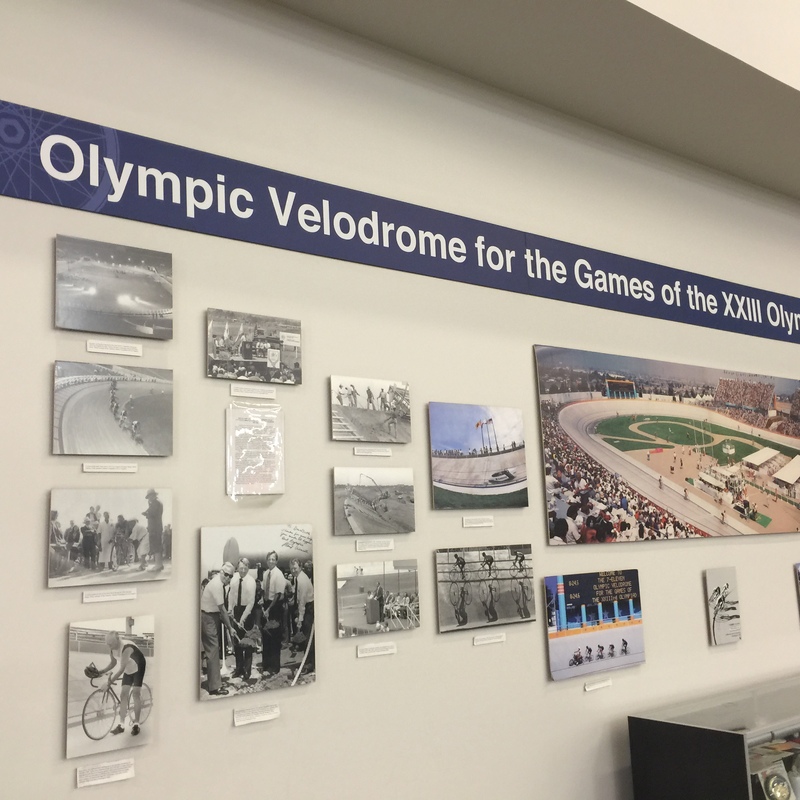 Velo Sports Center, which is adjacent to the STUBHUB Soccer Field Stadium, sits on the campus of Rancho Dominguez Hills Community College. 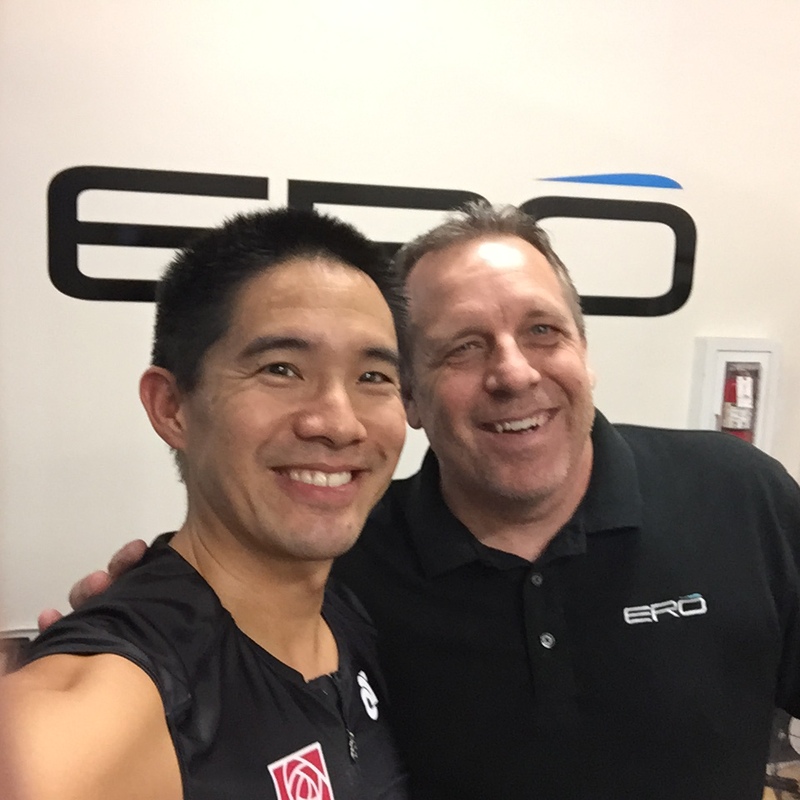 Jim Manton at ERO and me. 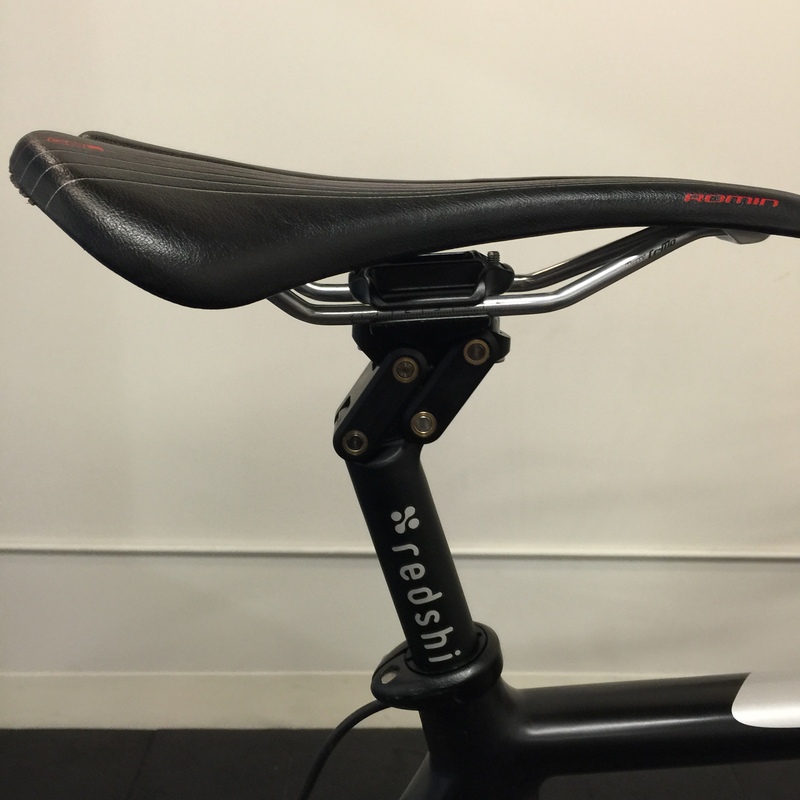 Adjust the saddle with the Redshift Seatpost. My road position. Seatpost back and down position. Hands on hoods. My aero position. Seat post up and forward position. 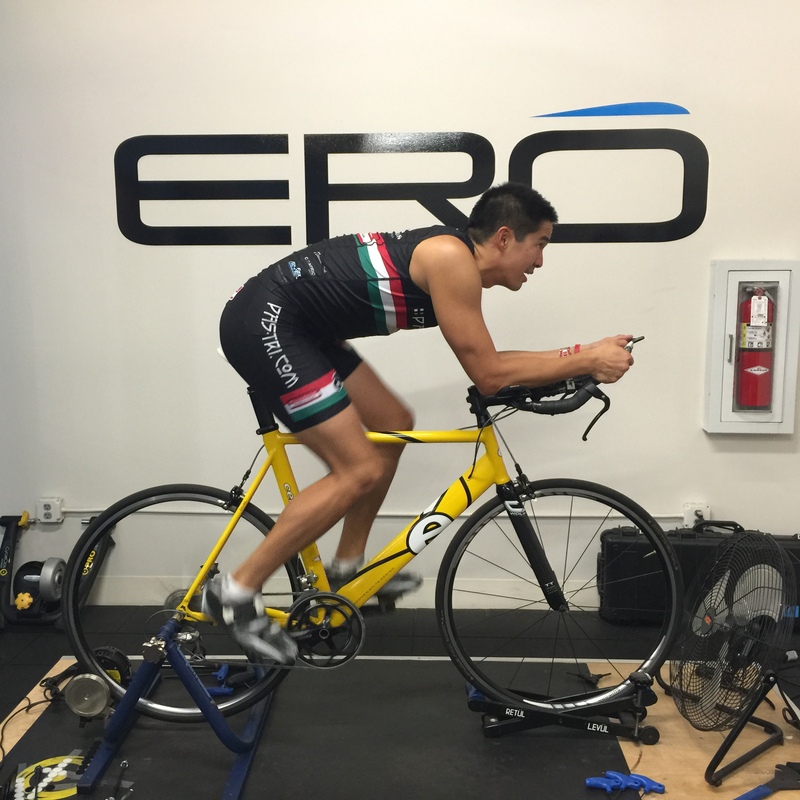 Forearms on pads and hands on aerobars. Aero bars are extended and the elbow pads are angled for comfort and support. Jim moved a head tube spacer ~2 cm, from below the stem to above the stem. This lowered by handlebars. Here’s my Cervelo Dual TT bike with final fit and aero position. 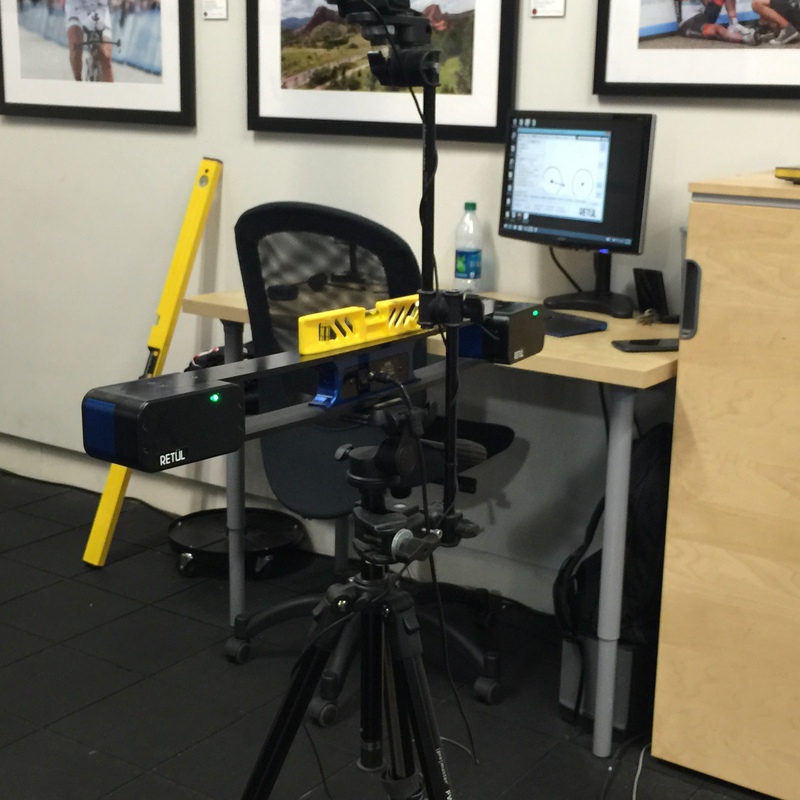 Retul System for first timer data. Camera setup with PC in background. 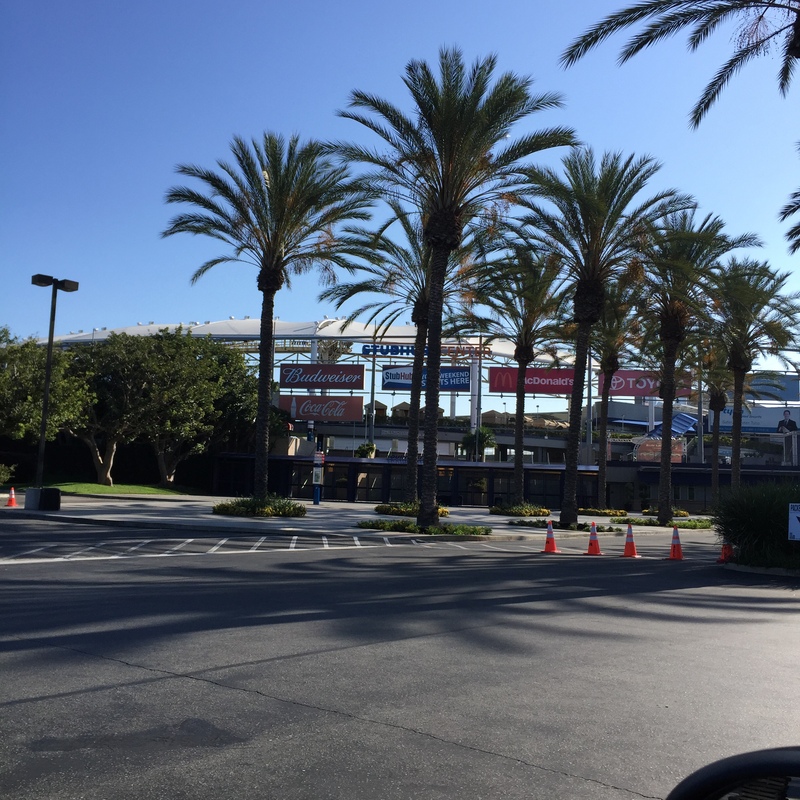 Stubhub Center. 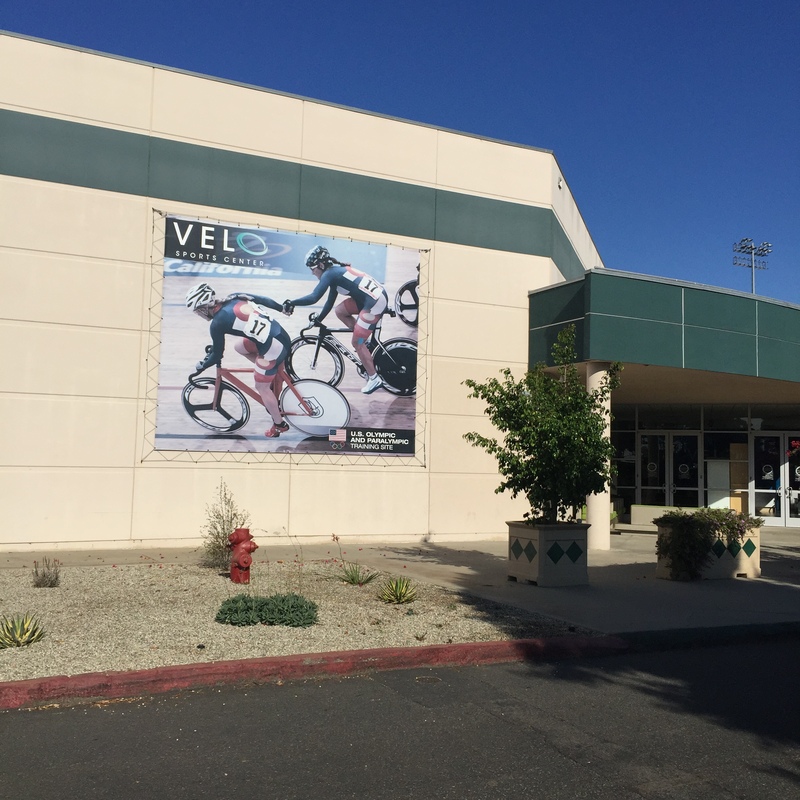 Velo Sports Center. 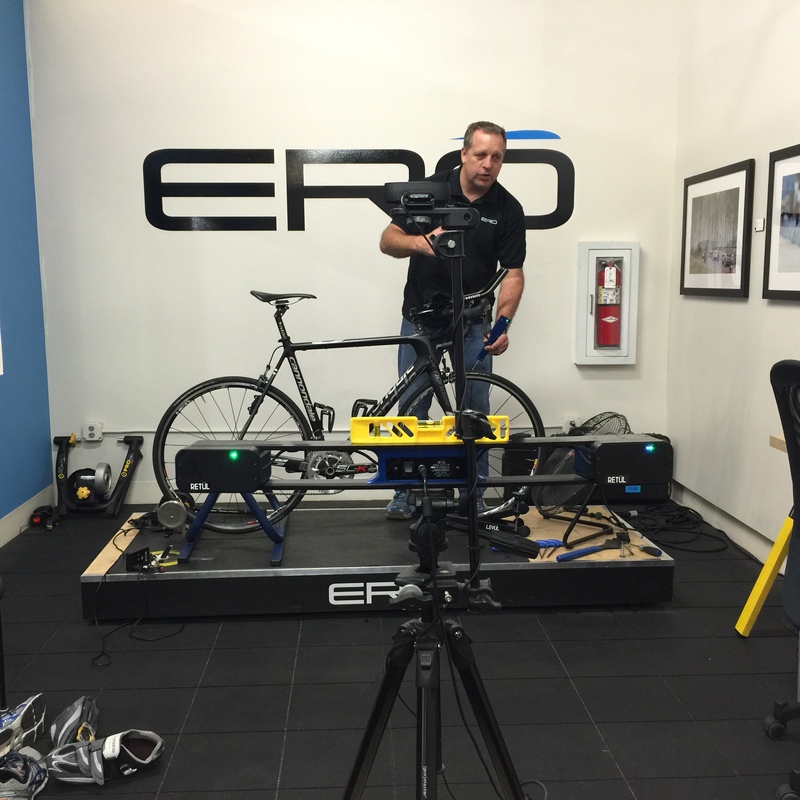 The bike fitting looks very technical. It is probably very helpful during races. Good luck on training. 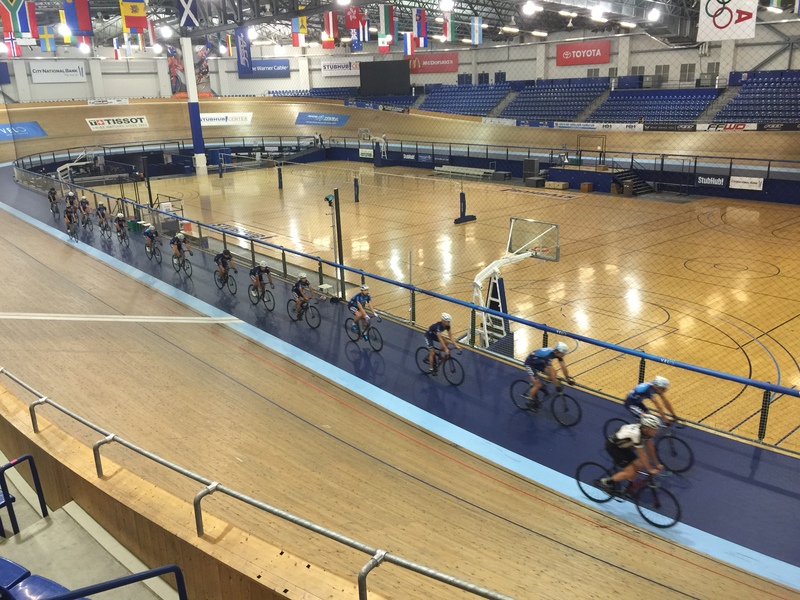 ← Coaching for IMMT. Weeks 1-3.